There are so many labels on an egg carton nowadays that it’s easy to be both overwhelmed and confused. It is simply not possible to buy cruelty-free eggs. There are so many labels on an egg carton nowadays that it’s easy to be both overwhelmed and confused. What do all these labels mean? And what do they not? Let’s start with the labels that mean nothing. Labels like “Happy Hens” and “Ethical Eggs” are purely marketing ploys designed to make us feel good and buy the eggs. Who in their right mind would want to be unethical and buy eggs from sad mistreated hens? 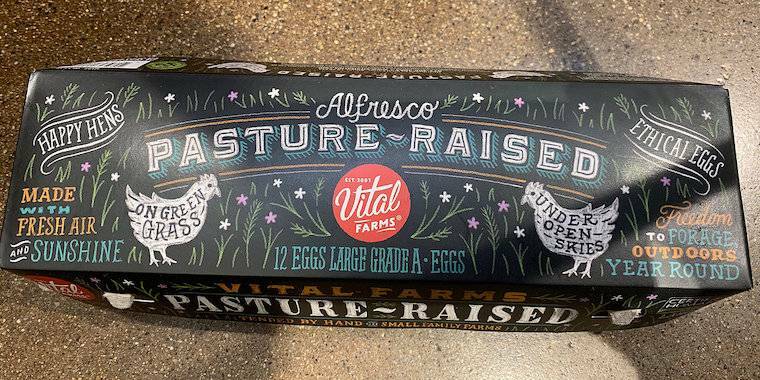 Similarly “Farm Fresh” evokes the image of a farmer getting up with the roosters to collect still warm eggs from straw nests and rush them to the local store. However this label means nothing and is simply marketing. “All Natural” makes you think that the chickens are eating a natural diet and doing what chickens naturally do. But once again, this label tells you nothing about the egg or its production. “Grown Local” is another label that makes us feel good because we are supporting our local farmers. But it actually doesn’t mean much since there is no definition of what is local. And there are no restrictions in selling “local food” anywhere else. Unless the location of the egg farm is printed on the carton, we don’t know if the eggs have been laid locally or not. “No Hormones” or “Hormone-free“ is like putting a “fat-free” label on a bottle of water. No egg-laying hens are given hormones in the United States. It’s the law. Federal regulations prohibit it. “No Antibiotics” is quite similar. Antibiotics are very rarely used in the egg industry. And when they are used, they must be FDA approved and comply with a number of restrictions that assure that antibiotic residues don’t occur in the egg itself. Then there are the labels that tell you about the food the egg-laying hens eat. “Vegetarian Diet” or “Vegetarian Fed” indicates that the hens are on a vegetarian diet. This is actually a controversial label since chickens are omnivores. They eat bugs and worms when foraging. Therefore this label is not applicable when the birds have outdoor access. At least, this label inform us that the hens are not fed animal byproducts like ground chicken! “Omega-3 enriched” means that the hens are fed a feed enriched in omega-3. In most cases, flaxseed is added to their diet. Note that this label doesn’t tell or guarantee the quantity of extra omega-3 in the eggs. If you want to supplement your diet with omega-3, it may be more efficient to eat flaxseed directly. “Non GMO” informs us that the hens are fed a feed that is free from genetically modified organisms. The seal of approval is given by the Non-GMO Project. 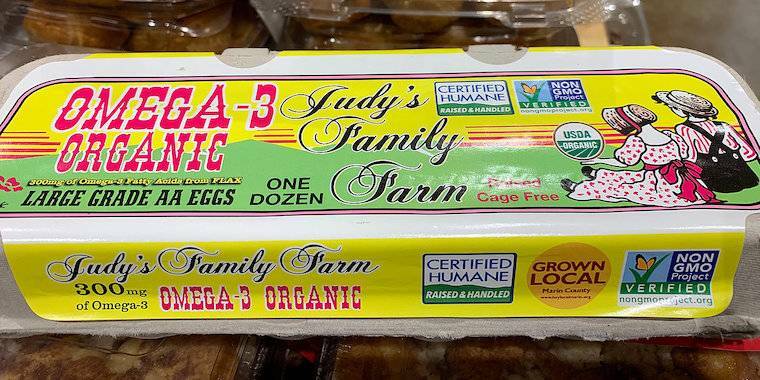 “Organic” indicates that the hens are fed an organic diet. This means their feed do not contain any GMO, antibiotics or hormones, and no synthetic fertilizers or pesticides were used to grow it. This label is regulated by the United States Department of Agriculture (USDA). The “USDA organic” label actually goes a bit further than feed requirements, it also prohibits the use of cages and requires some outdoor access. Unfortunately it is not specific in its requirements. Animal Welfare Approved is the highest standard of any auditing program. Each hen must be able to nest, perch, and dust-bathe indoors. They must have continuous access to the outdoors for ranging and foraging. No more than 500 birds can be kept in one flock. The program prohibits forced molting (see “Did you know?” section below), and is the only one to prohibit beak cutting. Regular where the hens may be kept indoors all the time but must be able to nest, perch, and dust-bathe. Free-range where the hens must have access to an outdoor area for at least 6 hours each day. Pasture-raised where the hens must be on a pasture with living vegetation for at least 6 hours each day. Enriched colony cages where the hens are in cages with less space than a legal-sized sheet of paper per bird. Cage-free where the hens may be kept indoor all the time but must be able to nest and perch. Free-range where the hens must have access to an outdoor area. Pasture where the hens must be on a pasture with living vegetation. Food Alliance Certified prohibits cages and requires access to natural light. All hens must be able to nest, perch, and dust-bathe. It prohibits forced molting but allows beak cutting. Caged where each hen has a space smaller than a sheet of paper. Cage-free where the hens may be kept indoor all the time with some nesting and perching requirements. 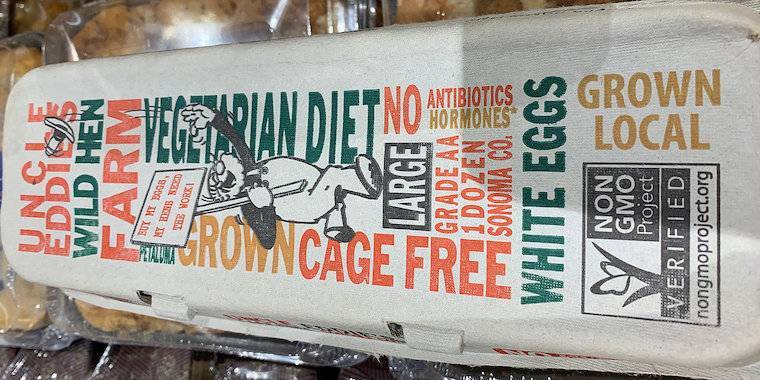 Although some standards are better than others in term of animal welfare, none of them certify that the eggs are cruelty-free. All male chicks are systematically killed, as well as all hens passed their egg production peak. Chickens are not protected under the Humane Methods of Slaughter Act, so male chicks are typically ground up alive and spent hens are gassed. It is simply not possible to buy cruelty-free eggs.